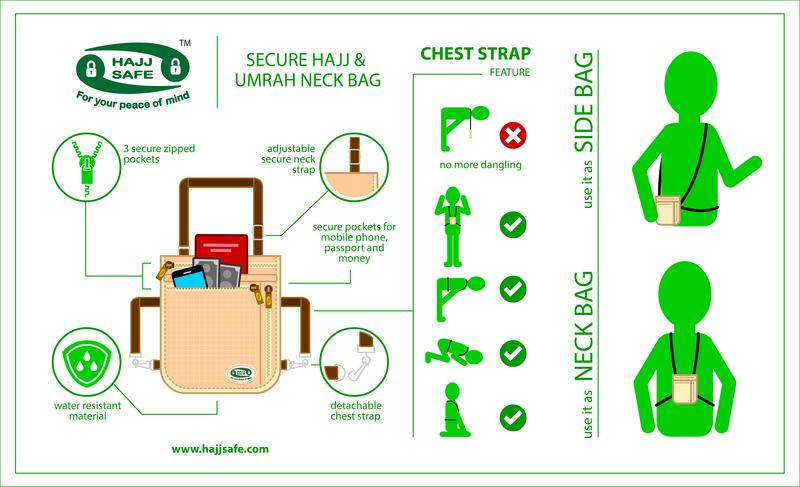 This is the ultra slim, secure Hajj and Umrah Neck Bag designed especially for women, men and children who are travelling for Hajj or Umrah. This secure Neck bag has 3 zipped pockets for you to carry all of your most important items safely while you perform one of the most life changing experiences of Hajj or Umrah. Hajj and Umrah Bag Suitable For Women, Men and Children The size of this secure Neck bag is 13cm x 14cm and it is big enough to carry your mobile phone, money, pocket dua book, earphones and more. This Neck bag has both a secure neck and chest strap that will be helpful for the pilgrim (women) when they perform salah (pray) as it will ensure that the bag remains in place. It also has a breathable mesh back panel as Makkah and Madina are very hot cities and it will help the pilgrim when they perspire. The secure zipped pockets will keep all of your valuable items secure and safe from any potential pickpockets. The Neck bag can be worn under the Hijab or over the clothes, it is discrete and very light. Small, good and safe bag--very useful in travel.